Above (top): crystals of annabergite. Down: crystals of Eritrine. Eritrine and Annabergite are the eventual members of isomorphous row. Form between itself transitional differences. Eritriy be found as crystals of prismatic-needle or plate tablet lamellar form, often grouped in the aggregates of radiant or fibred structure. Due to wonderful cleavage of mineral often forms scales or thin flexible plates, look like mica, in a gangue mainly quartz composition. The rounded forms of fibred-radiant addition are not uncommon. Sometimes as powder or earthy mass covers other minerals. Colouring is bright raspberry-red, purple-red, violet-red. 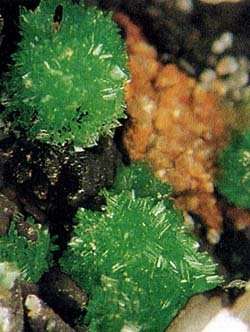 A rare green Annabergite and rose Eritrine secondary mineral consisting of hydrated cobalt and nickel arsenate in monoclinic crystalline form. Formula: rose Ni3(AsO4)2*8H2O - green Co3(AsO4)2*8H2O. There are shallow crystals of prismatic, needle-shaped, flattened type in majority, often with shading; they form clustered, star-shaped, stellar, stellate, radiantly-fissile aggregates, spherical, kidney-shaped reniform form crackershell; and also earthy the masses and raids. Cleavage very much perfect absolute, thin plates are a bit bent; closeness 3,07; color from rose-red to crimson with a violet honey agaric, as a result of decomposition becomes mother-of-pearl-grey (to greenish-gray). 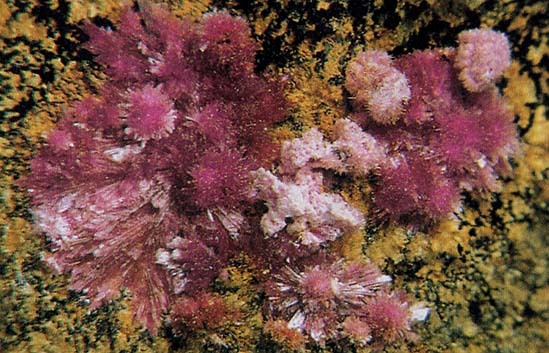 Eritrine (cobalt flowers), is a water arsenate of nickel and cobalt. Glance (glitter, glare) diamond, mother-of-pear nacreous or glassy. Transparent. On the tint of colouring reminds the flowers of peach. A line is inconspicuous-pinkish. Cleavage perfect absolute. Appears in the area of oxidization of cobalt ores. Crystals (monoclinic Crystal structure) are rare and usually very shallow, more frequent radiant aggregates, earthy the masses, triturate efflorescences and raids. Serves as the searching sign of cobalt ores. Be found in the Ore mountains (Germany), in Germany, England, Morocco. Annabergite forms druses of shallow oblate crystals of the typical apple-green colouring with glass brilliance and earthy stick. Annabergite can contain the certain percent (about 5-10%) of magnesium (variety of cabrerite). Eritrine forms powder of red color which at heating becomes lavender-blue, and then melt fuse easily. At an etch acid solution of red color appears. Annabergite is fusible and dissolves in acids. Before melting he blacken. Eritrine and Annabergite are the second minerals, characteristic for the area of the second changes of sulfide cobalt-nickeliferous mine deposits. They are accordingly named by a "nickeliferous flower" and "cobalt flower". The beautiful crystals of Eritrine meet on the deposit of Shneeberg in Saxony and in the mine of Bu-Azzer in Morocco. In Italy he is marked in Valsugane, on an island Elba, and on Sardinia. Annabergite got the name on the deposit of Annaberg in Saxony; it was found also in Garce, state of Colorado, in Lavrione in Greece and in Serra-Kabrera in Spain, where his variety is marked - cabrerite. Second mineral in the area of oxidization of cobaltic, cobaltous ores (skutterudite and cobaltite). Known deposits: in Saxony, Gessene, Shpessarte and Shvarcvalde (Germany); and also in France, Italy (о. Elba, Trento), England (Kornuoll). Remarkable crystals by a size in 2-3 sm, grouped in fissile wall outlets, find Antiatlas in mountains (Morocco). Very noticeable, brightcolored erythritic raids always simply specify on a rock, rich in a cobalt.